Inis the Energy of the Sea is a daring and seductive fragrance that embodies the coolness, clarity and purity of the sea, but at the same time representing its strength and energy. Inis is a revitalizing body lotion that combines natural shea butter and seaweed extracts along with minerals and vitamins that can nourish your skin. 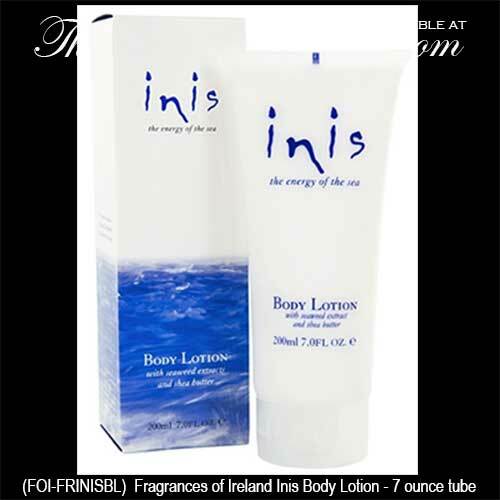 This Irish body lotion will moisturize your skin and leave it scented with Inis Energy of the Sea. The 200ml (7 ounce) tube of Inis body lotion, available at The Irish Gift House, is made in Ireland by The Fragrances of Ireland.